For whatever reason, the computer wouldn't read any pics on my camera the other day. 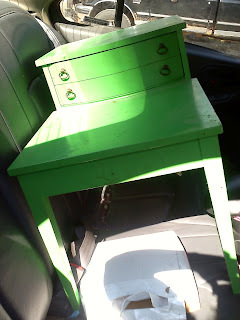 But I got it to work today and I was finally able to grab the pics so I can post this awesome furniture reveal! Yay! She wanted to use Old White underneath for the distressed areas. 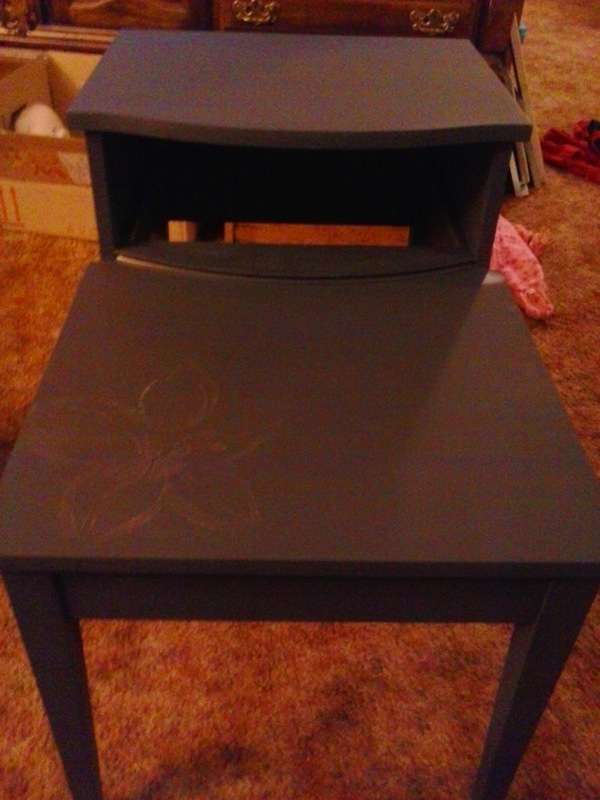 So I first set to work painting the edges and various other areas with Old White. After the Old White was on, I got started on the Aubusson Blue. 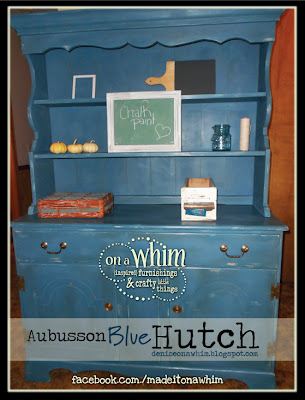 I love, love, love this color!! It's so gorgeous by itself, but once you get a little dark wax on it, it is even more perfect! 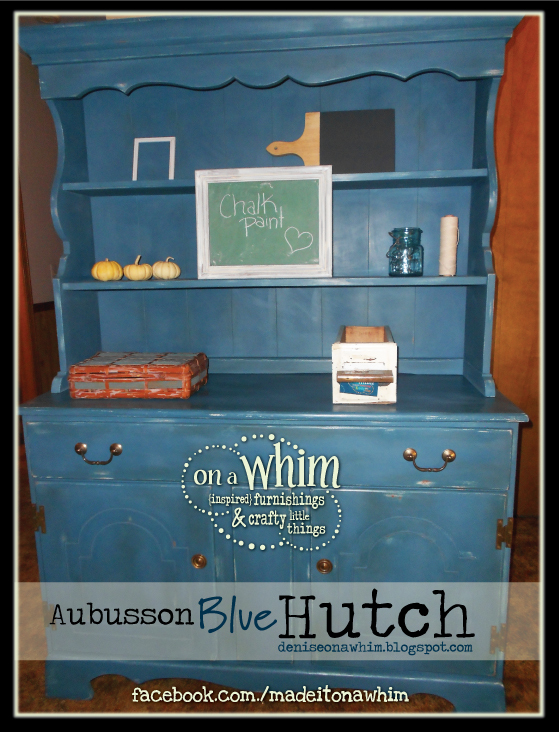 Like I've said before, Chalk Paint™ goes on like a charm and the whole hutch didn't take long to paint at all. And the distressing went really well, too. I distressed this one a bit more heavily than I did out last piece. I think I'm just feeling more and more comfortable with it as I go so the distressing isn't quite as daunting as it was on our first piece. 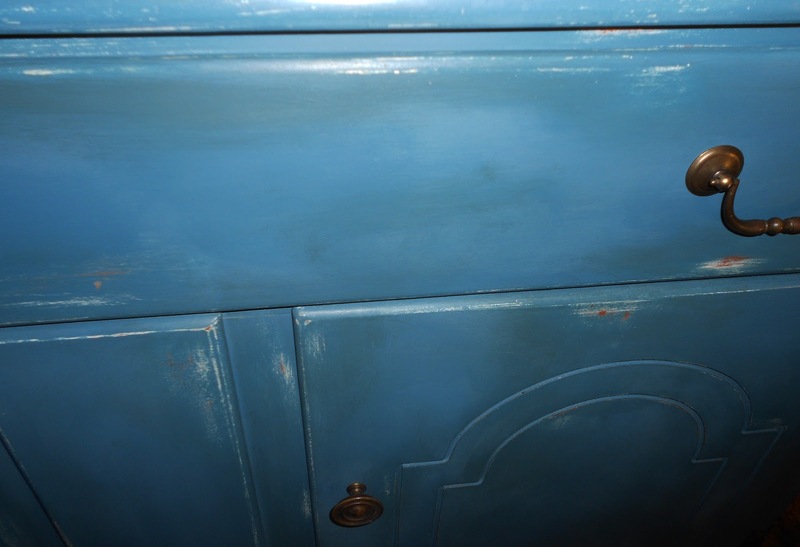 Besides, the more I work with the paint and wax, the more I realize that it would be such an easy fix even if I didn't like a spot I distressed... just paint it right over the wax and go again. :) I also distressed it so that some areas had the wood showing too, while most areas have the Old White peaking through. I'm glad I did, because I really like the dimension that gave it. Just wanted to share a fun little design I did today for Eric's friend at work. 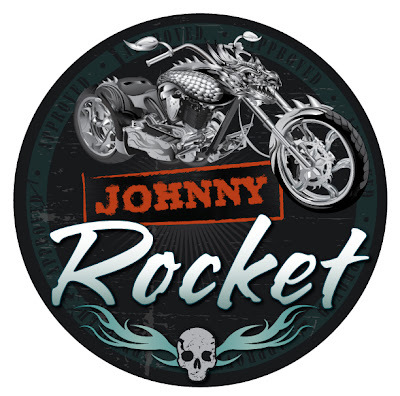 Johnny Rocket is Eric's nickname for the guy and Eric wanted me to do a decal for his buddy's tool box﻿. So, I came up with this. I do believe I like it. Wait... love it! I am a girly-girl pretty much. 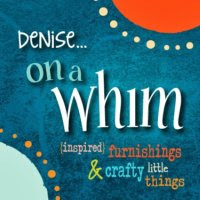 I like pretty things and I enjoy doing the shabby chic, cottage-style decor with my business. But, I must say, I love it when I can do a design that is manly. Other than the motorcycle element and the name, I got to start from scratch with no pre-conceived ideas about the design...my favorite way to design something!﻿ I love it when I can just go with whatever pops into my head and not have to follow a customer's ideas to the letter. Logo/sign/decal/whatever designing is fun. Sometimes lately I forget because, unfortunately, we have to build our name up here as far as design goes. The guys at United Sign Company are great at what they do (sign installations, electrical, and all that) but they haven't had an actual designer until they hired me. They aren't exactly known for it. So, I don't get to design as many brochures and logos and fun stuff such as this like I used to. I'm hoping that picks up soon. 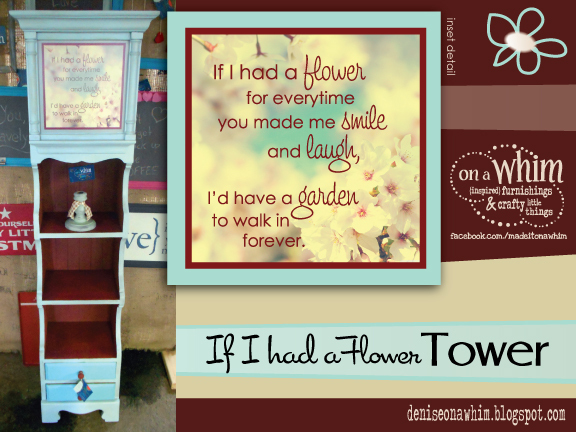 This was just a quick layout as a favor to Eric, so I used some clipart that I had on hand. I always keep a nice stock of good stuff to use when I need it. The motorcycle, for instance, is not my handiwork. A little too much detail for a favor, even for Eric. 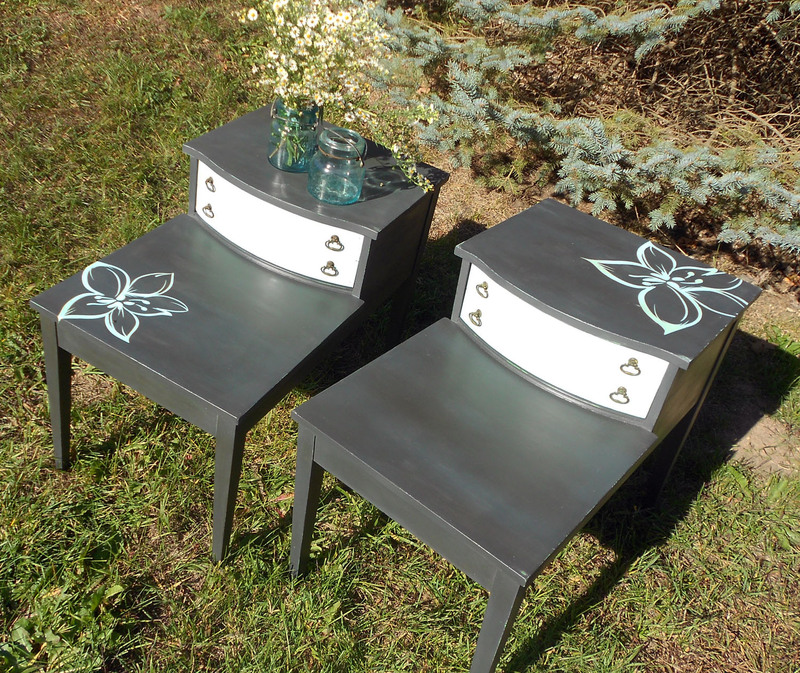 :) But, either way, I just love how this turned out, all grungy with a dash of metallic. (I even managed to add my favorite color in there!) Just wanted to share since I had so much fun with it. I wanted to share one of our projects with you today. 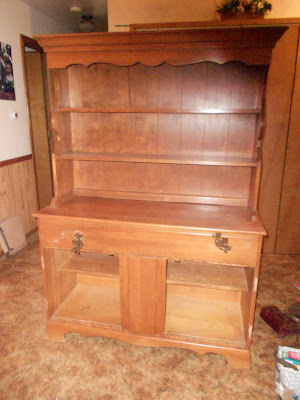 This shelving unit is one of the very first pieces we purchased at the local thrift shop here in Lowell (F.R.O.M.). When we bought her, she had an old faded picture of a rose in the top portion that served as a clock face. The clock didn't work anymore and the rose had seen better days. I never thought about taking a before pic or you could see for yourself how out-dated this great piece of furniture was. So we removed all of that and I printed up an original piece of artwork for her with a delightful little phrase. She's painted in a pale blue, with dark wood stain for aging, and ASCP in Primer Red. 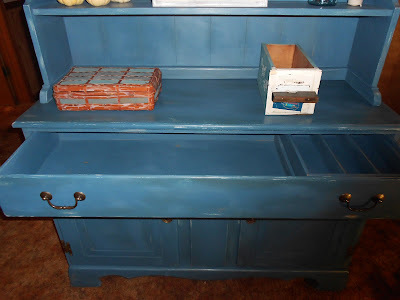 We painted the drawers in a slightly darker version of the blue so they would stand out a little from the body. I am fortunate enough to work at a sign shop. So, whenever I cut vinyl and have any leftovers, I save them for later use. I put some leftovers to use and cut my flower stencils. I am pretty good with computer design, but I'm not an artisitic painter by any means. I need a stencil! lol. 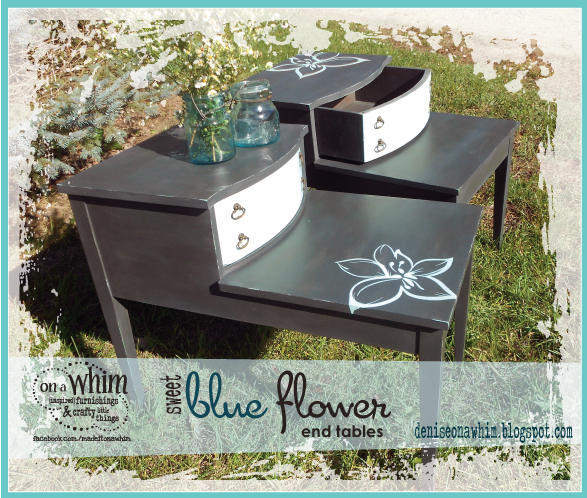 I painted the edges of the table, the drawer fronts and the area I would be placing the stencil on a pale aqua blue paint. 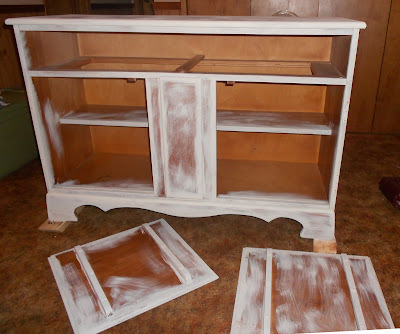 I used a home-made chalk paint recipe, combining plaster of paris and water along with some latex paint. 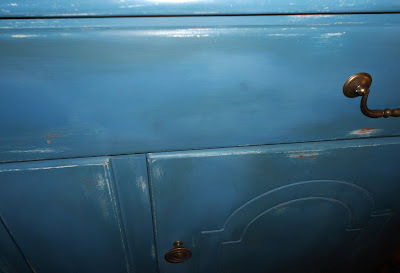 I simply love this color of blue latex paint I have and couldn't resist using it wth the ASCP graphite. I just knew they would be a great combination!